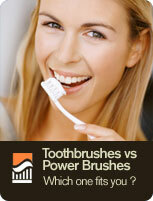 A toothbrush is quite simply a brush used to clean teeth. From ancient times to modern, from exploited animal hairs to synthesized nylon, toothbrushes have had a long and central history in dental hygiene. Although many toothbrushes have evolved to make use of power and motion, the basic notion of bristles on a handle has remained the same.